Here's the pride of the fleet. I fabricated this bad little beast to be an exact replica of the furnace at Iron Bridge in Shropshire, England. The furnace will tap 100 lbs. to just a smidgen over 220 lbs. on the second slagger. White hot iron, professional molds and a well oiled crew equals flawless castings. Here is a video of the furnace in action! Enjoy! This portable aluminum/bronze furnace that I created with the assistance of a few students at Northern Illinois University (Andrew Malczewski and Carrie Hrubec) was designed to support a number 30# crucible and it does so with ease. This little Cadillac furnace will melt non ferrous metals like chocolate in your hands. 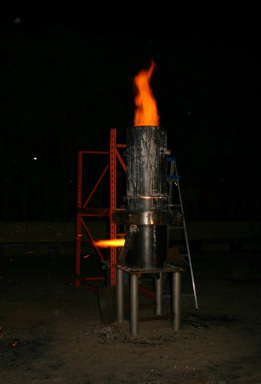 With safety and critically technical engineering tolerances designed into the furnace "Honey Boo Boo" will assist in producing clean metal, beautiful castings and a whirl wind of sculptural work. Here is a video of the furnace in action! This is what happens when the worlds of printmaking and sculpture collide!? The idea behind Fire and Ink is to combine methods from printmaking and sculpture to produce both sculptures and prints. The results so far have been fantastic! Featuring John Medina, Eric Fuertes and super star artist Joseph Velasquez and Ryan O'Malley of Drive By Press!